The Peace Lily is a favorite houseplant. In the spring, it produces long-lasting white blooms. The plant itself has glossy oval leaves with a striking point that emerge from the soil. They are tropical plants and do exceptionally well when potted indoors under the right conditions. Peace Lillies are a member of the Araceae family and related to other aroids, including anthurium and alocasia. Typical of aroids, the white flowers emerge from the leaf stalk surrounded by a cupped white spathe that gradually fades from pure white to a greenish or yellow color over time. The central spadix, or floral spike, is either white or yellow. The blooms can last for two months or more and then the plant will enter a time of non-blooming. Despite their name, peace lilies are not members of the lily family. While not lethal, it can be dangerous for animals or humans to ingest peace lillies. The Peace lily is a striking plant when used in a mass display. They bloom in the spring with long-lasting flowers that hover gracefully over the leaves on thin stalks. They can also be forced to bloom in the fall or winter. A well-grown Peace Lily may bloom twice a year, resulting in several months of flowers. They are terrific houseplants. Small varieties look attractive on a tabletop and bigger ones can occupy a nice-sized spot on the floor. They filter more indoor pollutants than most other plants, so are great for bedrooms or other frequented rooms. Inside the tropical plant's pores, toxic gases like carbon monoxide and formaldehyde are broken down and neutralized. Peace lilies only grow outdoors in tropical habitats like Florida or Hawaii. If you have potted peace lilies, move them outside during the summer months, but once temperatures dip, bring them back inside. Peace lilies are shade-loving plants in their native habitats. Quite naturally, they prefer light to moderate shade in the home. Some varieties can withstand more light than others. Curled, pale leaves generally indicate that the plant is receiving too much light and scorched leaves indicate too much direct sun. In either case, the plant should be moved to a shadier location. Peace lilies like a rich, loose potting soil containing plenty of organic material. They are used to living in the tropical canopy and are used to growing in soil rich with deteriorating bark. During the summer, water and mist the plant frequently because they thrive with higher humidity like that of the rainforest. In winter, reduce watering but never allow the soil to dry out. If your water is highly chlorinated, use filtered water. These plants really prefer moist warmth. Avoid cold drafts and temperatures below 55 degrees Fahrenheit, since it will die with cold temperatures. Ideal temperature range is 65 to 80 degrees Fahrenheit. Spritz the leaves every week with soft or distilled water throughout the summer growing season. Feed weekly in the summer or use slow-release pellets at the beginning of the season. Do not fertilize in the winter. Repot peace lilies annually in the spring or as needed. They're easy to propagate by division while out of the pot. Large plants can be divided into clumps, which can then be independently potted. Always use a high-quality potting soil. Peace lilies have been heavily hybridized and there are dozens of varieties available. They range from miniature to massive and from deep green with snow-white flowers to golden-leaved beauties. S. Mauna Loa: This is a larger plant, that grows up to 2 feet high. S. Mojo: This striking, large plant has vibrant green leaves. S. Golden Delicious: The new growth on this variety has a golden-green color that is stunning. S. Starlight: The narrow leaves on this plant have wavy margins. It's also known for heavy, multiple blooms, with as many as 20 flowers on a single plant. Protect your children and pets from the peace lily. Though they're not a true lily and are not lethal, they can irritate the stomach or cause extreme salivating if ingested. Cats and dogs that ingest peace lily leaves will begin to salivate profusely. 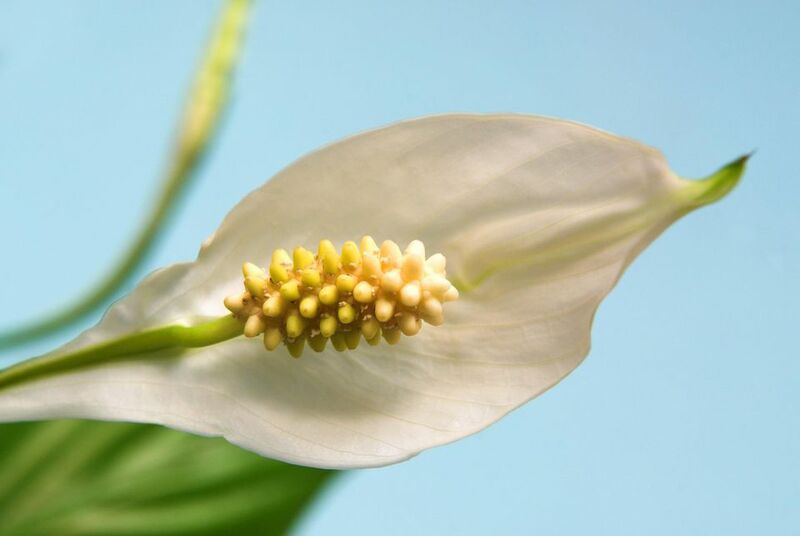 If left untreated, peace lily poisoning could lead to renal failure. Speak with your vet or poison control if you suspect your child or animal ingested this plant.